The sheer strength of Joe Hill's darkly hilarious, emotional gut-punch of a novel has forced Alexandre Aja to grow as a filmmaker to meet the challenge of adapting it for the screen. Muzzling some of his more overtly reprehensible proclivities and having integral narrative reason to depict others for a change, the director of such misogynistic, adolescent dreck as Piranha 3D and Mirrors has finally made a good movie. Stretching well outside his comfort zone, Aja ably imbues the picture with the lush magical sensibilities of a gothic fable seeping into the reality of a young man wrongly persecuted for the murder of his girlfriend. That Ig Perrish (Daniel Radcliffe) bashed in the brains of Merrin Williams (Juno Temple) is a forgone conclusion for most of his family, friends and neighbours. Enraged and grief-stricken, Ig goes on a bender and wakes up the next morning sporting the angry red welts of nascent horns threatening to mature beneath his scalp. Everyone that sees these distressingly devilish protuberances remain oddly unperturbed, but are almost immediately stricken with an urgent compulsion to conspiratorially confess their deepest, darkest secrets. These unfiltered revelations provide most of the story's effective gallows humour and a great deal of pathos — learning what people really think of you can be harsh, at the best of times, imagine what mom thinks when she's certain you're a deranged killer. Ig uses his newfound abilities of persuasion to investigate Merrin's death, with the rest of this nasty twist on the coming-of-age romance fleshed out via flashes of memory, both voluntarily recalled and forced. Most of the changes made to the text for the screen are relatively minor, shuffling a bit of structure to make the telling more linear, and while that does deflate a bit of the mystery, it doesn't hinder the spirit of the story. One decision does though. For reasons that appear to have more to do with the availability of a certain location than what's best for the story, Aja shifts much of the key action in a way that undercuts a vital bridge to the narrative's otherworldly aspects. Resultantly, the mythical components feel a little disconnected and under-explained. That lack of connection hampers other parts of the film as well. Since the historical relationship between these characters is so important, the movie could have used a little extra time to establish the rapport between Ig, best friend Lee Tourneau (Max Minghella) and Ig's drugged-out musician brother. 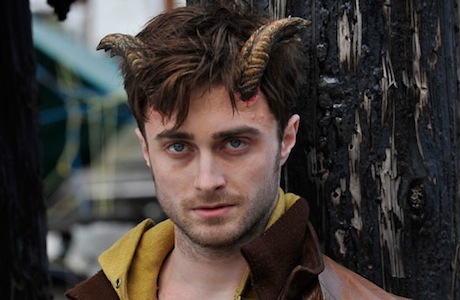 Juno Temple and Daniel Radcliffe have great chemistry, with the latter giving the best performance of his career; it's not easy to sympathetically emote when you're turning into the devil. The background details are rich and the performances strong. However, there's terseness to the pacing that's suitable for action, horror and comedy, but short-changes the emotional impact of the heavy personal drama, which is what's required to make this more than above-average horror fantasy.